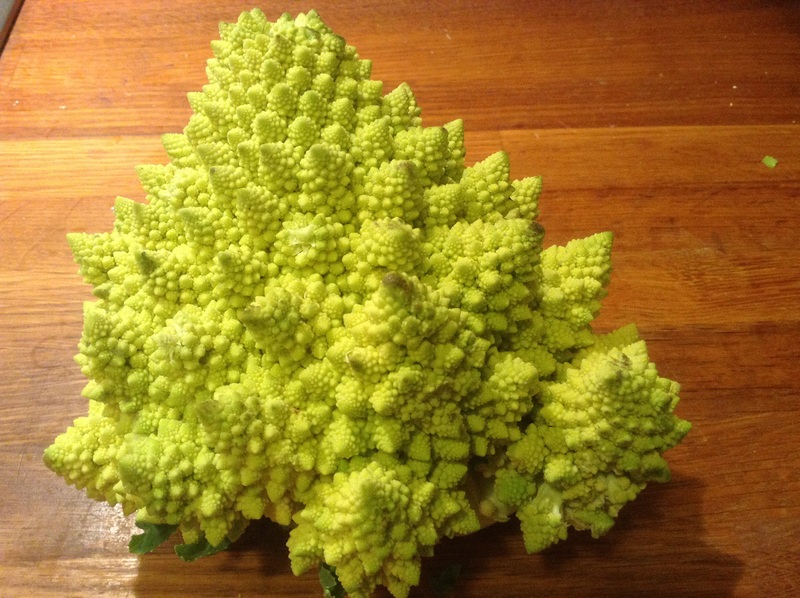 Broccolo romanesco is beautiful, and I have had one in the fridge for several days. I was planning on making pasta with this particular broccolo romanesco, with garlic and peperoncino. After fighting colds all week, ordering Christmas gifts, and running errands, we really fancied pizza, so that’s where the broccolo ended up. I head to Norway soon for an advent weekend to see the family there and drop off presents, hence the need to be organised so early. Hopefully there will be room to bring back Christmas food as well, mmmmm……. 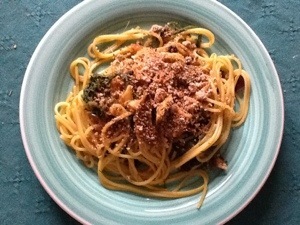 Anyway, pasta with broccoli is super too: see Rachel Eats for an excellent recipe for this, and delightful writing. She has a cookbook coming out next year, which I am sure will be wonderful. This is a Gabriele Bonci dough recipe, his pizza is amazing! See video here on how he handles the dough: https://www.youtube.com/watch?v=sKotvbfWdU4 It is in Italian, but just look at his technique and that beautiful dough. Mix, leave for an hour, then add salt. My husband uses smoked salt which is just delicious, found in the Mercato Centrale of Florence. Leave dough to rise 6-7 hours at room temperature. You can also leave it overnight in the fridge, 24 hours there is recommended. I confess, we had not planned that far ahead, but 6-7 hours at room temperature worked as well. It will rise and become wonderfully gloppy and elastic. It needs to be handled carefully, to keep the air bubbles in the dough. No rolling pins here. I washed and chopped the broccoli into florets, and boiled them until slightly al dente. Take the skins of the sausages and chop into large pieces, and fry then off. This is optional, you could just pop the uncooked sausage meat onto the pizza but the pizza is slightly less greasy this way. 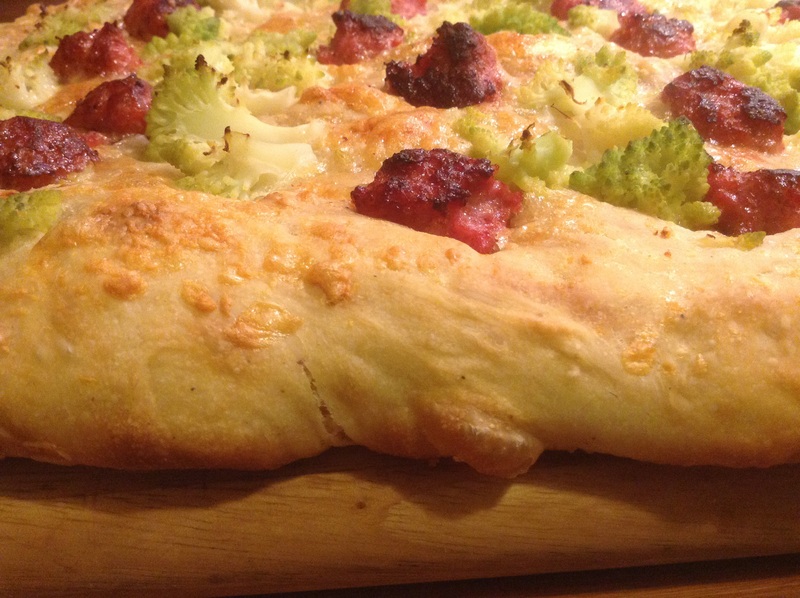 My husband is the pizza master here, and after experimenting, he uses oiled baking parchment. Bonci presses the dough out into an oiled baking tray, but our IKEA oven barely gets to 250C so we pre-heat the oven tray and slide the dough over using the parchment. 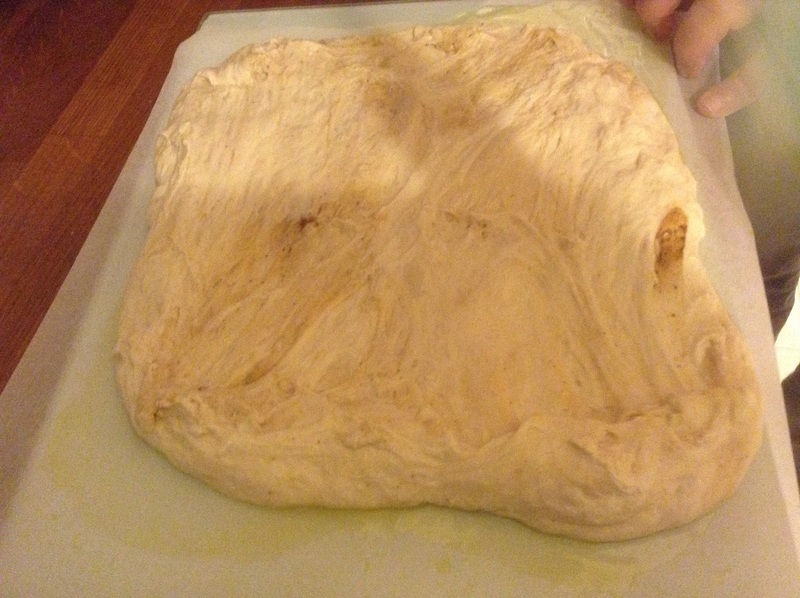 Here, the dough is just poured out, then eased out using fingers to stretch into a rectangle. The darker bits are just streaks of smoked salt. You want to keep the air bubbles, so gentle is the way to go. My husband does all kinds of topping variations, depending what is in the house: often vegetarian. Patatas bravas, with potato and paprika; roast vegetables; pesto and mozzarella; cheese and onions; tomato and mozzarella; Thai chilli chicken……. All good in different ways: choose the toppings you like. 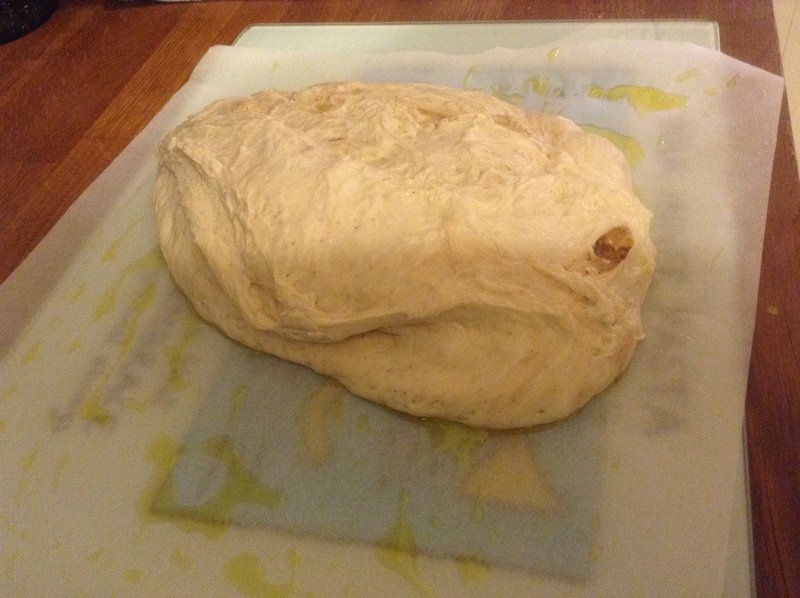 This is a great dough to work from, it is buoyant and tasty. Good for weeknight cooking, as you can do the dough prep the night before, and the toppings can be assembled while the oven heats up. I love thin crunchy Roman pizza, but this one is very good too. As we settled in to having pizza last night while watching TV, I saw police lights and heard shouting. Lo and behold, students from the local school (Socrate) were having a demonstration. 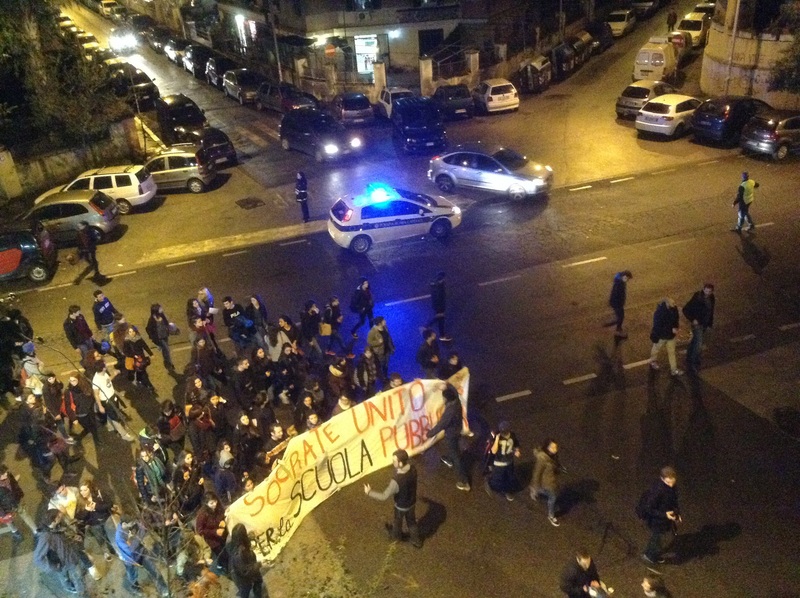 Perfectly peaceful, the students were chanting and the police kept traffic out of the way as they students marched. Always something happening in the pizza below. I am bring this to Fiesta Friday #44, a little late but happy to be back. Thanks to the gracious hosts: Angie @ The Novice Gardener, Prudy @Butter, Basil and Breadcrumbs and Jess @Cooking Is My Sport. Happy first Sunday of Advent to all! 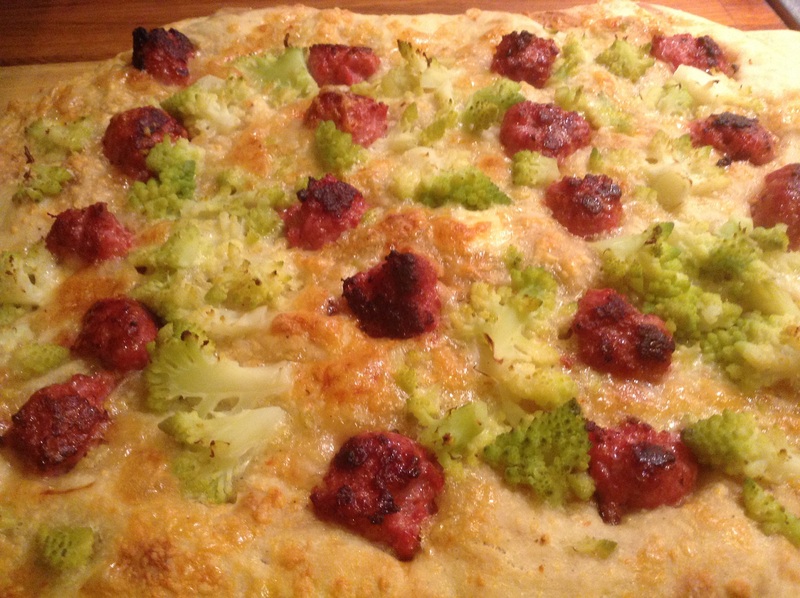 This entry was posted in baking, food and tagged broccoli, Fiesta Friday, pizza on November 30, 2014 by krumkaker. The Egyptian greengrocer had avocados this week, and nice ones they were indeed, after a few days of ripening in the kitchen. I had great plans for them. Maybe Finnish avocado lime pasta? But I got home late, after enjoying post-work drinks (and too many crisps….) with a friend, so ambitions were lowered and we improvised with what we had. Very tasty it was as well. Fry the bacon, if using, and drain on paper towels. Drain the fat from the frying pan (a milk carton will do, for later disposal) and sauté the fresh spinach in the same pan until it wilts. Drain if needed, then remove from pan and set aside. Heat the mashed potato. In a separate dry frying pan, heat the flour tortillas on both sides. Assembly: Divide the mashed potato between the two tortillas. Add the sautéd spinach. Arrange the avocado slices across the centre, and crumble over the cooked bacon. Serve with a little garlic dressing (if you wish), roll it up and enjoy. Serves two. Note: We had brought bacon from the UK, and had leftover mashed potato with onions and cheese sitting in the fridge, so I used that, but half a tin of drained and crushed cannellini beans with a chopped onion would be lovely as well. This was fast and tasty, but is hardly food mile neutral. Along with British bacon, Norwegian garlic dressing and imported avocado, the tortillas were at least Italian. Those can be expensive here, but these came from Todis, a discount supermarket that for some reason has decent flour tortillas, not just the thicker piadine that Romans like. They also have excellent Romanian sour cream, not in the dairy section but in the meat section with obscure Romanian sausages. 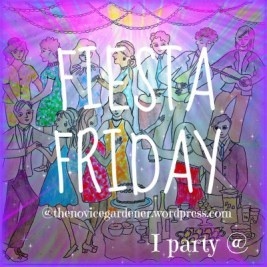 I am bringing this to Fiesta Friday at The Novice Gardener this week, as an impromptu contribution – like when friends drop by at dinner time, you are having a drink and are getting hungrier but nobody fancies leaving home, and you need to rustle up something from what you have on hand. Unplanned can still be delicious. Happy FF to all! This entry was posted in food and tagged avocado, Fiesta Friday, wraps on November 14, 2014 by krumkaker. 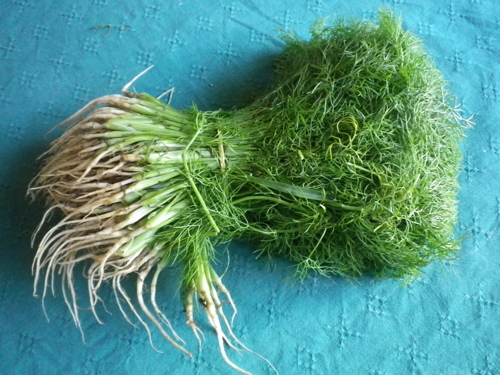 Wash the wild fennel, removing any brown bits and cut off the lowest part and roots. Heat the olive oil in a frying pan, and gently fry the chopped onion. 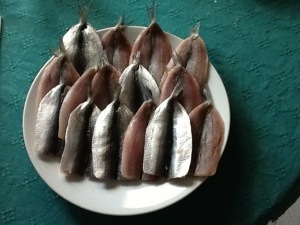 Add the sardines (yes, with tail – we get them in the frozen food shop filleted like this) and the anchovy fillets, with a little white wine if you have some. Cover and cook gently for 7-8 minutes. Add half the fennel to the pan with the onion and sardines. Meanwhile, boil water for the pasta. Add pasta and the rest of the fennel to the boiling water, and cook until pasta is al dente. Drain off the water, then pour pasta (with fennel) into the sauce. Add pine nuts and sultanas, toss, and serve with a sprinkle of toasted breadcrumbs. I am not sure what I will be cooking the next few days, but pumpkin risotto for sure, maybe a potato-leek soup, or something with cauliflower. Maybe melanzane alla parmigiana? Salmon with miso and sesame? The gas company is coming tomorrow to change our very old gas counter, so I have taken the afternoon off to wait for for them. Hopefully there will be time to also go stock up on vegetables and get some real food in the fridge again (not just jam, wine, pickled herring and mystery chutneys). Also, my husband will get home! Yeah! 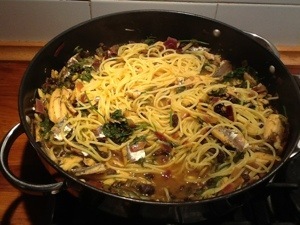 This entry was posted in food and tagged pasta, sardines, wild fennel on November 11, 2014 by krumkaker.